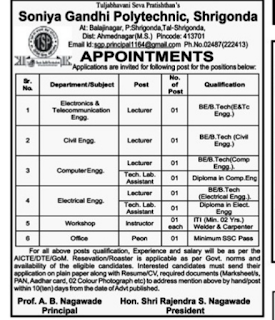 Soniya Gandhi Polytechnic College, Shrigonda, Maharashtra has advertised for the recruitment of Teaching Faculty- Lecturer,Non Teaching Faculty jobs vacancies. 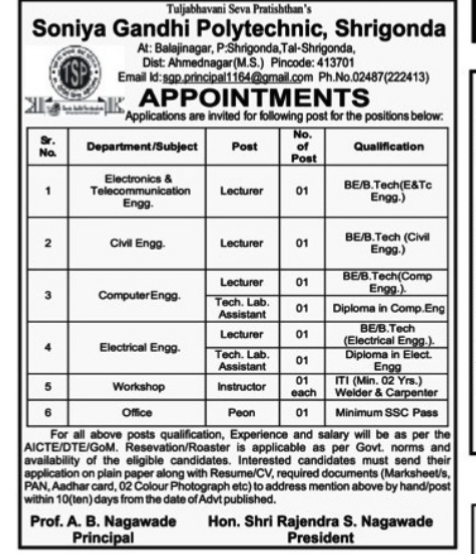 Interested and eligible job aspirants are requested to apply with in 10 days from the date of publication. Check out further more details below. Name of the College: Soniya Gandhi Polytechnic College,Shrigonda,Maharashtra. About College:Soniya Gandhi Polytechnic, Shrigonda an Institute established in year 2009 and is managed by Tuljabhavani Seva Pratisthan (TSP). The Institution is approved by A.I.C.T.E. & Affiliated to MSBTE. Located nearer to the Maharashtra’s most livable, cultural and cyber city Pune, and associated with one of the regions finest university, the campus attracts students from all over the Maharashtra. This is being established in 15 Acres at balaji nagar, Shrigonda,90 km off the Pune. How to Apply: Interested and eligible candidates must send their application on plain paper along with resume/CV ,required documents (Marksheets,Aadhar card,PAN,2 color phopograph) should sent to below mentioned address within 10 days from date of advertisement by post/person.